The Carnegie Mellon women's and men's team placed first in the home invitational last week. 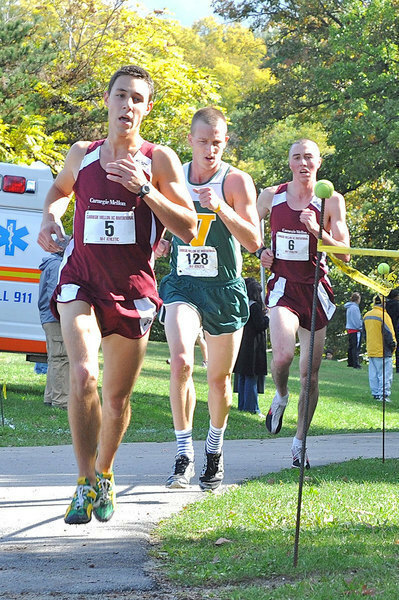 On Saturday, the annual Carnegie Mellon Cross Country Invitational took place at Schenley Park. The invitational was a huge success, with 18 teams and over 300 athletes participating. Despite the fierce competition, Carnegie Mellon’s runners rose to the top. Both teams placed first overall, with the men scoring 29 points and the women scoring 54 points. The men competed in an 8K and the women raced a 5K. The depth of talent present on the men’s team shined through at the Invitational as five of the Tartans finished in the top 10. Junior Dan Addis finished third overall with a time of 25:56.13, followed closely by junior J.P. Allera (26:02.99) and sophomore Matt Jacob (26:04.41), who placed fourth and fifth. Junior Nate Bussiere earned eighth place with a time of 26:30.39, pursued by senior Dario Donatelli, who finished ninth in 26:35.15. The women’s cross country team also reached new heights at the Invitational when they defeated two Division II teams to steal first place. In the 5K, five of the women were able to finish in the top 20. First-year Emily Wobb once again led the Tartans, attaining fourth place with a time of 19:02.79, followed by junior Courtney Baker, who finished in 19:28.68. Junior Danielle Morse (19:59.55), sophomore Cassie Wallace (20:10.31), and first-year Jackie Altshuler (20:34.29) rounded out the top five for the Tartans, earning 11th, 13th, and 20th place respectively. The Tartans will compete in the Oberlin Invitational next Saturday in Oberlin, Ohio.